Now that Senators have reconvened from summer hiatus, one of their first tasks will be to contemplate the greenhouse-gas cap-and-trade carbon market that President Obama would like to institute to blunt global warming. Their necks better be limber. Partisans of Keynesian, market-based regulations will undoubtedly point to the Midwest's federally run "acid rain" program to reduce harmful power-plant emissions as proof that giving industry profit incentives in cleaning up their operations can be successful. Regulation skeptics will wave that example off dismissively, urging Senators to swivel their heads for a look across the Atlantic, where the European Union’s Emissions Trading System has registered lousy results. Whatever those markets do or don't foreshadow, if the American Clean Energy and Security Act of 2009 and its mandated cap-and-trade become law, a glimpse of an unintended — and unsavory — future may reside in the tale of the inscrutable businesswoman from smog-bound Southern California who scammed the area’s pollution exchange...twice (see my site, www.chipjacobs.com, for the newest revelations of a second scam). Rather than a tale of a dreamer’s demise, Anne Sholtz’s story is a bracing reminder that to create a market, no matter its aim, is also to inspire a class of people determined to game it. If Wall Street traders can commodify sub-prime mortgages with impunity, and the Enrons of the world can manipulate energy markets like a pinball machine, imagine a future when tradeable permits for carbon dioxide and other heat-trapping gases are auctioned and swapped over the public’s head. A Heritage Foundation economist expects the action to hit $5.7 trillion in value, and many experts say it all adds up to an irresistible buffet for chicanery. Few in Washington ever heard of Sholtz, 44, before last spring, when the former Caltech economist was sentenced in federal court to a year of home-detention and five years of probation for defrauding the nation’s first air pollution cap-and-trade market. Sholtz was cozy with the RECLAIM program and the bureaucrats who run it at the South Coast Air Quality Management District (AQMD). That’s because in the early-1990s she had helped design the concept as an adviser. Her know-how proved dangerous. Between November 2000 and April 2001, Sholtz tried fooling one of her clients, a New York-based energy trader, into believing she could complete a fat, multimillion-dollar deal with what is now ExxonMobil Corp. when in fact she could not. Stringing executives at the client company along until she could reactivate a transaction, she emailed and faxed falsified sales documents, including phony invoices. Pleasant, brainy and ever-hustling, Anne Sholtz was not somebody folks expected to see handcuffed. Her 2004-arrest by EPA agents on white-collar fraud charges shocked and mystified local environmental circles. She and her companies, Automated Credit Exchange and EonXchange, had boasted a heavyweight list of clients and financial partners, and had worked with the Dutch government on an emissions test-market. As one of California's rising green-entrepreneurs, Sholtz was a niche-celebrity with access to powerful politicians and regulators, and a hillside mansion, fine cars and whatnot to show for her ingenuity. For our purposes, the reasons she’d risk all that matters less than the fact she was able to do so undetected. (You can read the entire expose here.) 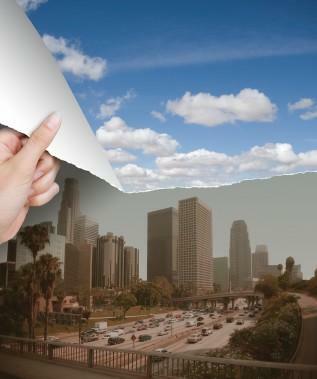 And that Obama’s proposed carbon market would look a lot like L.A.’s now 15-year-old smog bazaar. RECLAIM sets progressively lower emissions’ limits for roughly 330 of the Southland’s largest oil refineries, power plants and other manufacturers, and allocates credits calculated for each one. Companies that install new particle-trapping equipment or develop cleaner operations in other ways to reduce oxides of nitrogen and sulfur can sell their unused credits to peers who may exceed their allotment. Since 1994, there have been about $1 billion in trades, which brokers help negotiate, and about 40-million pounds of smog chemicals transacted. RECLAIM added another bold move to Southern California's environmental pedigree, a change that industry actually wanted. But in developing such an open-ended, boutique market officials essentially flaunted their gullibility to cheaters, scammers and profiteers. It took AQMD several years to learn of Sholtz’s deceit, and only then after nine of her clients complained about being cheated. A year before that, in 2001, the air district had been blindsided by California’s electricity crisis, and the subsequent order by then-Gov. Gray Davis that power-plants run nonstop to prevent rolling brownouts. Speculators from Texas to New York with no industrial operations in the South Coast basin hoarded RECLAIM credits they knew utilities needed, later reselling them at huge markups. The market teetered near meltdown, and district brass had to yank power companies from the market. Ironically, one reason AQMD officials were oblivious to Sholtz’s actions was because they’d nixed her very own recommendation during RECLAIM’s design phase to stamp each credit with identifying marks, somewhat akin to a bar code. Loose trade-reporting requirements added more vulnerability. As California's experience makes clear, building an incorruptible greenhouse-gas market may not be just formidable, it may be impossible, because the money and opportunities for deception are so tantalizing. This May, two Republican congressmen skeptical of Obama’s cap-and-trade plan, Joe Barton of Texas and Greg Walden of Oregon demanded extensive answers from the EPA about the Sholtz case. Why, they asked, were so many case documents still sealed by the Justice Department? How could this have happened on regulators’ watch, and what does it portend for a greenhouse-gas market? On their heels, AQMD executive officer Barry Wallerstein defended his market as virtually bulletproof to further criminality, while the EPA downplayed the matter as an isolated case. Those declarations occurred before documents emerged showing that Sholtz had told prosecutors during her 2005 settlement plea about “rampant” violations and graft by AQMD executives administering the market. All of which is to say Senators should look straight forward with furrowed, “prove-it” brows when fellow members and environmental glitterati pronounce that a greenhouse gas market will operate cleanly because really smart people with nifty technology will be policing it. As the Waxman-Markey legislation stands, the Federal Energy Regulatory Commission, the EPA, and perhaps several more agencies will be patrolling for fraud, speculation, price manipulation and so-forth. Other enforcement details are hazy.